Within the walls of cities, great men and women inspire nations and lead civilizations to their peaks. Choose them wisely and they will help bring your city achieve greatness. Neglect them and they will lead rival cities... or their armies! 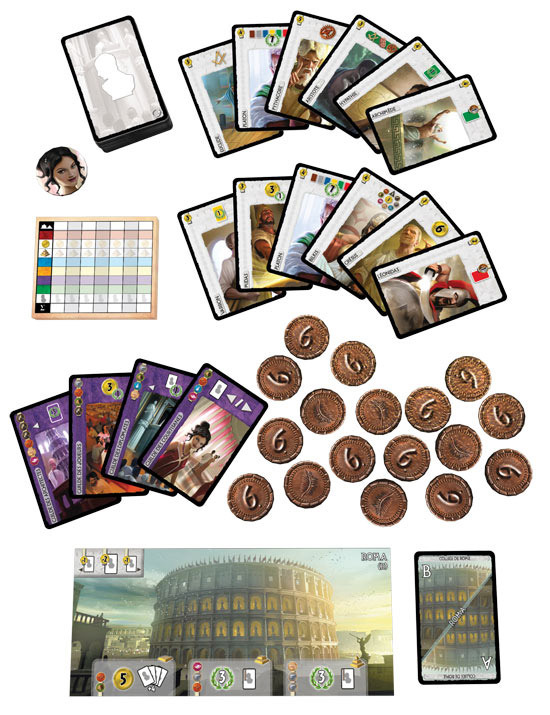 This expansion for 7 Wonders offers you a new type of card which will bring an extra strategic dimension to your games: the Leaders. This is an expansion for the game 7 Wonders, the basic game is required to play. Jeremy's notes: 7 Wonders Leaders is an exceptionally well thought out expansion that builds upon an already great framework of play. The introduction of 36 new Leaders into the game creates a larger palette of viable options for both planning ones building placements as well as scoring ones civilizations at the end of the game. 7 Wonders: Leaders is the first expansion to one of my favorite games of all time. 7 Wonders on its own is the entire package for me–engaging gameplay, beautiful artwork and seemingly endless replayability. When I had started getting into 7 Wonders, I hadn’t even thought of expansions, there was just nothing that I could think of to improve on the current game. Yet Antoine Bauza still managed to do just that. Leaders adds another aspect to the game that greatly affects the way the game is played. Right before you pick up the cards for your first age, you take a certain number of Leader cards (determined by the number of players) and make hands of four for each player. You pick and pass them, just like you would for an age, except you don’t discard the last one, you just pass it on. At this point, you have four leaders and the opportunity to pay to build one at the beginning of every age with one extra that you don’t end up playing. How does this change the game? Leaders influence the path you take throughout the game. There are leaders that straight up give you things like gold, victory points, sciences or military strength, but there are also those that offer incentives for playing a certain way (i.e. extra gold for upgrading your buildings or extra victory points for having one card of each color played). The hand of leaders you end up with makes for a good outline of the way your game should be played because you have an advantage over your opponents in the area now. If you feel overwhelmed by the amount of choices 7 Wonders throws at you, adding Leaders to your game might actually help make those choices for you. However, that’s not the only thing that Leaders adds to the game. Leaders also adds an eighth wonder, the Colosseum of Rome. Rome works with the Leaders as it allows you to build more than three per game and also makes them cheaper for you and your neighbors (to a lesser degree) to purchase-–it is an interesting and welcome introduction to the game. While Leaders might be a rather simple expansion, it does manage to accomplish the unimaginable in improving one of the best games that I have ever played. That alone makes it a definite purchase in my eyes. That said, if you own 7 Wonders you shouldn’t feel compelled to purchase the expansion, but if you’re burning out on the base game or want an extra little kick for your 7 Wonders game-–it’s just what the doctor ordered. – Enables you to have some ‘secret’ objectives that youcan use to tip the game for your favour, which is all too important in a game where chasing a single victory condition is a very strong strategy. – Some of the leaders seem far stronger then the others. Overall it is a great expansion, that fits seamlessly into the game and is easy to teach. The disappointment mostly stems from the lack of variety that the game adds on top of the leaders feature itself, and the fact that it is sometimes too easy (especially for newer players) to use the leaders as just another stack on top of their tower of ‘victory condition x’, which is a fault in this games design (imho) that the expansion does not address to its fullest with these leaders. I was very pleased with the Leaders expansion for 7 Wonders. The leaders add a nice amount of depth and strategy to the game without adding much more time and explanation to the game. The first time or two may add about 10-15 minutes because everybody will be passing the book back and forth to see what their leaders do, but once everybody gets to understand the new pictures this becomes quicker. Mechanically the leaders add interesting twists to the game. Before the game starts each player gets 4 leaders. You draft these by picking one and passing the pack. Once each player has drafted their leader hands the game can begin. When using the expansions each player starts with six coins because the leaders all cost gold and not resources. Before the start of each age players have the Leader Phase, you pick your first leader and play him face down, everybody reveals and pays the cost and the leader enters play. You can also discard a leader card for three gold or use it to build a phase of a wonder. Nero for example (my personal favorite) costs one gold and gives you two gold for every military victory. Some leaders will give straight up victory points and some will allow you to subtract any one material cost of a type of card. There a lot of these guys to choose from so there is a good amount of diversity each game. Also in the box are six value gold coins, the Roma wonder card and 4 new guilds. The Roma card is very interesting; instead of producing resources it allows you to play leaders for free, or reduce your leader cost by two while reducing your neighbors leaders by one (depending on which side). The new guilds are pretty interesting, the courtesan guild allows you to place a courtesan token (included) on a neighbors leader letting you use their leader ability. My groups all love 7 Wonders so I grabbed this expansion with the hopes of keeping the game fresh and it did that and so much more. Everybody has used them insists we use them in every other game we play. What a treat! We’ve been playing 7 Wonders with the Leaders expansion for a few days now and we all agree that it’s among the best expansions ever produced. It doesn’t step on the rest of the game, and adds some great new decisions early on. It does add just a bit more complexity to the game, so I recommend not using the Leaders when introducing new players to 7 Wonders. The expansion introduces a new Wonder, Roma, which relies heavily on the new Leader cards. Because of this link to the new mechanic/rules/feature, I recommend not using the Roma Wonder until you’ve played with the leaders for a game or two. The expansion also includes 4 new Guilds, which dovetail nicely with the existing guilds. These just get shuffled into the other guilds. You still draw the same number, based on the number of players. The big change is the introduction of the leaders, which are provided as a new deck. Before the first Age, you’ll do a quick draft, selecting 4 leaders using the same kind of passing that the rest of the game employs. The leaders each provide an ongoing benefit. You’ll recruit one new leader at the beginning of each Age, paying gold for them. I’m not sure the balance is exactly right on the costs of each leader – some are real bargains. I’ll discuss a few of the leaders in a Strategy post about this expansion. Highly recommended. As always, shop your FLGS first! Few games have made the popular splash that 7 Wonders deservedly has. Its first expansion, entitled “Leaders,” promises to add to the fun by providing leaders for your civilization. The gameplay is very straightforward and fits extremely well with the base game. Four of the aforementioned leaders are drafted in the same “pick a card and pass” manner as the ages and this is done before the traditional rounds begin. They are then added to your civilization once before each of the traditional rounds (you may purchase one, use the card to complete a wonder level if you can fulfill the requirements, or discard a leader for gold). The leaders contribute to your victory point total in both straightforward (it gives you another tablet, provides gold, gives you additional shields, etc.) and clever ways (it sends your -1 military defeat tokens to your neighbor, it gives you bonus points for having a card from every color in your civilization, etc.). Overall, the leaders will give more focus to your civilization from the outset allowing you to know what strategy you want to pursue from the beginning. However, since you do not immediately reveal all of the leaders you have, your opponents will not be tipped off to your intentions too early. As a historian, I cannot help but note the terribly anachronistic nature of the expansion. Now, it depends on your personality how you will react to this. In other words, seeing Nebuchadnezzar commanding Roman Legions, Aristotle building the pyramids, and Julius Caesar admiring gardens in Babylon will either drive your creative juices to wonder what the world would have been like if that had happened or drive you insane by killing any joy you received from the historical flavor of the game. Of course, the vast majority of 7 Wonders players probably won’t care one way or the other and will just be happy to have a few more cards to play. As long as I’ve noted one historiographical issue with the game, I might as well go for broke and list one more that I find rather comical. It’s hard not to note that the game designers attempted to score points with the politically correct crowd by scouring the annals of the ancient world for any female “leaders” they could find. Consequently, the game comes with some howlingly obscure female leads. The laughable irony however is that any goodwill won through inclusivity was immediately lost by the artwork, which portrays every single one of these ladies as scantily clad, buxom seductresses. Surely this is ancient history as only a hormone ravaged Junior High boy would picture it! At the risk of sounding more negative than I wish to, I will in conclusion say that the value you get out of leaders largely depends on your gaming group. In my case, I play 7 Wonders almost exclusively with new players. As such, I don’t include Leaders as it adds too much unneeded complexity when someone is learning the game. If that describes you, I would probably pass on purchasing the expansion. However, if you have been playing 7 Wonders for a while with a set group of gaming veterans, then Leaders is a fantastic way to breathe new life into a great game and I wouldn’t hesitate to highly recommend the purchase. Too much of a good thing can spoil a pot, but the Leaders expansion ultimately adds just the right amount of new spice to spruce up the tasty 7 Wonders dish. 7 Wonders: Leaders exemplifies what I feel a good expansion should do, it stays true to the original game, while changing the way I think/feel during play. The Leaders expansions adds an extra phase, before each age. You draft four leaders at the beginning of the game, and you can play (by paying coins) one leader before each age. Each leader will give some form of benefit, with their cost comeasurite with this benefit. You may get victory points, military strength, a bonus for having a type of card or multiple types of cards. You could gain money, benefits to future leaders, science symbols, or reduced costs for certain card types. (Instead of playing a leader, you can discard one for 3 coins, or use it as a card to build a wonder stage). There are new guilds added in to complement the leaders, and an 8th Wonder – Rome (9th if you have the Manneken Pis promo). The main gameplay is unchanged, except for the added Leader phase. You are free to play the game exactly as before, but now your choice in leaders may impact the decisions you make. This is what makes the expansion really shine for me. While playing the age, I have in the back of my head which leaders I have coming up, and have to evaluate the risk/reward of any play. For instance, there are leaders that give you a bonus if you have certain color cards out. Is it worth building a card that doesn’t help me as much to try and get the bonus points? Or do I ignore the leader and play as I would have before? I view the game differently, even though the play is the same. If you are experienced in playing 7 Wonders, the extra rules are very minor and quick to pick up. I would advise against playing with the leaders if you have people new to the game; this is not a complexity issue, but to help new players grasp the game better with fewer choices. The added time to the game is rather minimal, a few minutes at most. I expect that all games I play with experienced 7 Wonders players will include this expansion going forward. If you like 7 Wonders, it’s well worth giving these leaders a try! I love 7 Wonders, so when I got the chance to play the expansion at my Friendly Local Gaming Store, I couldn’t say no! it comes in a small box (similar to the FFG silver-line) and has a bunch of new leader cards, a few new guilds, a new wonder and higher denomination coins. I’m so glad this came with more coins, the original game didn’t have enough and my group was constantly making change. The new 6 value coins help with this. The new leader cards are recruited at the start of the game. (4 total, one for each phase and an extra). at the begining of each age you’re given the opportunity to play one. These can really boost your score, but can be really expensive financially to get out. The new wonder and guild cards focus on the leader cards, helping them tie into the game. One aside would be that some of the symbology used on the leader cards can be opaque. We had to look up several of them and didn’t really understand how the symbol represented the given bonus/ability. All-in-all, if you love 7 Wonders, this is a no brainer. It extends the replay-ability even further than the base game! MUST HAVE! Leaders adds a another wrinkle to an already excellent game. You have to draft 4 leaders (3 of which you can play) before the first age and then at the beginning of each age you can pay to play one. Some are free but some can be expensive depending on the possible VP payout at the end of the game. Draft wisely or your leader may just cost you the game. The additional cards, money tokens and wonder board (Roma) are well worth the cost of admission. Basically, what these cards do is to give you great cards at the beginning of the game. The cards are only great if you are able to fullfill the requirements on the cards, which is a simple enough. But for a first try of 7 Wonders, the task is suddenly daunting, as you have no clue as to what these powers actually do during the game. Sure, you may sell the card for gold, but then you’d lose some possible points. After understanding the basic game and then adding this expansion, then it is an enjoyable experience. There’s not much added, and it doesn’t change the gameplay drastically. It does, however, open for 8 players and it doesn’t make the game any longer. Not very much new, but it gives the game a little “extra”, so it’s a nice expansion to own. 7 Wonders adds a four card drafting round prior to the start of the game proper. Please keep in mind that my four star ratings above reflect the views of someone who likes the basic game. To summarise what the expansion does, you choose one of the leaders to keep and pass the rest. After you have kept three (discarding the fourth) the game begins, but prior to each round you can decide if you want to play one of the three leaders you kept (paying its cost…you also start with three more gold than in the basic game so that you have enough money to build any leader before the first age), discarding it for money, or using it to build a stage of your wonder. If you’ve played the basic game you will have no problem learning what to do. If you like the game, you will want to play with this expansion, but if you don’t like 7 Wonders, the lesders will certainly not make you change your mind. Once you play with this expansion, you’ll never take it out of your base 7 Wonders set. It truly completes the base game, making it even better than it originally was. Something to keep in mind though: The Leader cards are a fantastic addition, but players should make sure to not depend on them too much. While they can help you focus your strategy, they’re generally not a game changer. The original game cards and mechanics are still the key to most of your points, but these cards can add a few tricks up your sleeve. The beauty of the 7 Wonders – Leaders expansion is how easily it fits into the original game, and how little time it requires to pick it up and play. The Leaders expansion adds just the smallest dimension to the game by taking what was once dead time in the game (in between ages where age cards are being passed out) and makes it active (i.e. deciding which of your leaders to put into play). If you have played 7 Wonders before and like it, there is absolutely no reason not to get this expansion as it adds another layer of depth and cuts down on dead time where players are waiting for cards to be passed out. 7 Wonders is always an enjoyable game to pull out, especially with it’s quick setup and fast play. When they came out with the Leaders expansion, we were a bit skeptical and wondered how adding a few new cards could really affect the game. Happily, we were wrong. Leaders adds an entirely new feel to the game and our game group considers it a worthwhile purchase all around. Adding the new leaders makes the game much more deep. Really recommended if you like the original game! While 7 Wonders can fairly easily stand on its own as is, this delightful little expansion adds a new layer of potential strategy without adding too much complexity. The art on the new leaders’ cards remains as eye catching as the original game art. Fans of the original game will thank themselves for adding this expansion to the collection. Add a Review for "7 Wonders: Leaders"